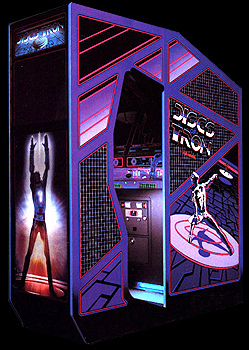 Easily the greatest video gaming experience of my life, I first played the full environmental cabinet of DoT at Disneyland’s Starcade. Enveloped in black light and stereophonic sound, I was there, on the gaming grid of the mainframe, until I died playing (i.e. ran out of quarters). The Starcade opened in 1977, a few years before Tron came out, and I almost always spent a couple of hours there. I remember mostly the slew of Tron games (both the original with the light cycles and DoT) and rows of pristine air hockey tables. For the opening of the really sillyTron: Legacy, Disney opened a replica of Flynn’s Arcade and filled it with old school games, including the original Tron and a newly released Space Paranoids designed to look like the game Flynn played in the original movie. No DoT to be found, sadly, at least not in the video teaser below. Hopefully these beauties were moved to the Starcade, which is something of a cultural landmark in itself, though it has been neglected for many years, the top floor closed off (that’s where my DoT was), two tired air hockey machines and that stupid basketball toss game on the ground floor. 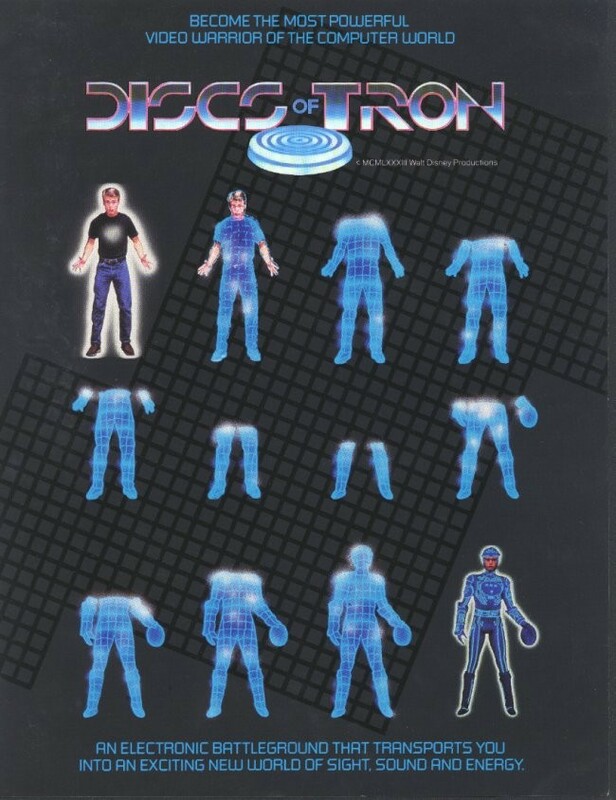 UPDATE (1/10/12): I don’t know how long it will last, but you can play Discs of Tron and Classic Tron at the Disney Game Site. Yup, DoT was probably my favorite game as well, next to Xevious. The complete immersion in that cabinet really did the trick, especially with that black light and that killer joystick thing that glowed eerily in your hand (with that cool little “circuit board” graphic on the top part). It was the funniest thing when you glanced Flynn with your disc and he would teeter on one leg on the edge of the platform…giving you the perfect opportunity to totally waste him with a direct hit in the chest. What a satisfying moment indeed. Xevious was HARD! All these games were hard, though. No saved games for us. You lose your men, you start at the beginning. Heck yeah, Xevious was hard. There was one particular part where out of nowhere this HUGE mega “black ball” thing drops down and explodes, sending a whole barrage of “bullets” flying everywhere. I had to prepare myself to maneuver between them or else I was history. The thing I loved most about that game was some of the abstraction or weird “alien technology” they depicted…there were tanks that had a solid “bubble” dome on them, yet they fired missiles from their tops, as if the dome was some kind of membrane with no discernible opening. Then there was the detail, like when you blew up tanks or buildings (pyramids), they left behind craters with glowing embers in them. Totally dug that game. I always saved up my quarters to get as far as I could on that game at the local bowling alley. Typically the game was totally vacant, but one day this older guy (he must’ve been in his late 20’s or maybe early 30’s) was on it, and he was freakin’ GOOD at it, just going on forever and ever. He even knew all these secret locations of “flags” that gave him extra men. I felt like I was watching this dood play for a good 40 minutes or so. It was crazy.